West Regional Voting Deadline: 11:59 p.m., Monday, March 7. North Regional Voting Deadline: 11:59 p.m., Sunday, March 6. South Regional Voting Deadline: 11:59 p.m. (PST) TONIGHT, Saturday, March 5. With all the votes coalated in the East division, 9th-seed New Hampshire snuck by 8th-seed Vermont, 14 - 13. New Hamphire will therefore be representing the seals-on-blue contingent against always-controversial Maryland. The love-it-or-hate-it nature of the first-seed flag could make this one an interesting match-up. Whereas fifth-seed Delaware bested 10th-seed West Virginia without too much trouble, 17-10, fourth-seed Massachusetts barely held off 13th-seed New York, 14-13. 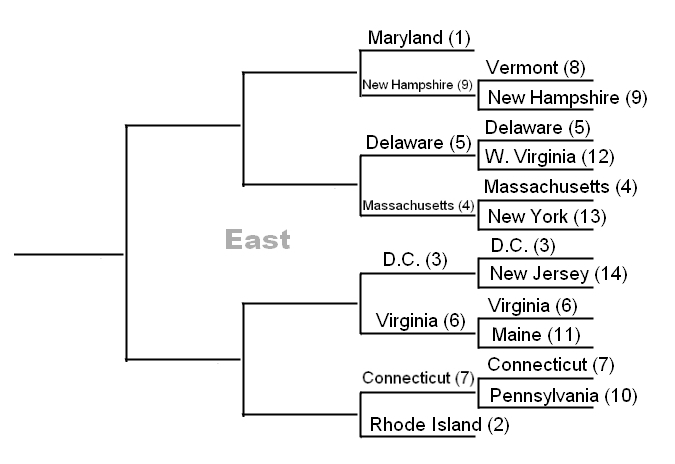 Seal-on-slate-grey Delaware will take on seal-on-white Massachusetts next week for a shot at the Sweet Sixteen. Meanwhile, in the Middle Atlantic, the third-seed District of Columbia routed the Garden State, 31-4. D.C. will be hoping for a repeat performance against sixth-ranked Virginia, which defeated Maine 16-11 in round one. Voters at the Life and Times broke for seventh-seed Connecticut and Vexillophiliacs tended for tenth-seed Pennsylvania; when the dust settled, it was the Constitution State on top, 15-11. 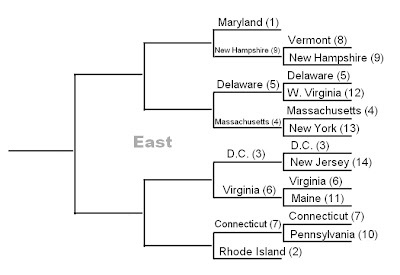 Connecticut will advance to take on the second seed, neighboring Rhode Island, in the second round. Action resumes in the East Division on Monday! Pooh. Three of my choices got slammed. EXCELSIOR! It's always heartbreaking when an underdog gets so close. How was the seeding determined? By how well the flags performed in the regular season, of course.